Two-year-olds are occasionally terrible, but more often they are terrific! They love fiercely and live entirely in the moment. Developmentally, they are growing by leaps and bounds. Still, the very nature of their growth makes parenting them challenging. They have not learned to think logically, so often want things that are unreasonable. Toddler attention spans are short, so it’s important to offer them a variety of experiences. When choosing activities for your child, remember that there’s a tremendous difference between children who have just turned two and children who are about to turn three, although they are all technically two-year-olds. Here are some activities to try out with your toddler. 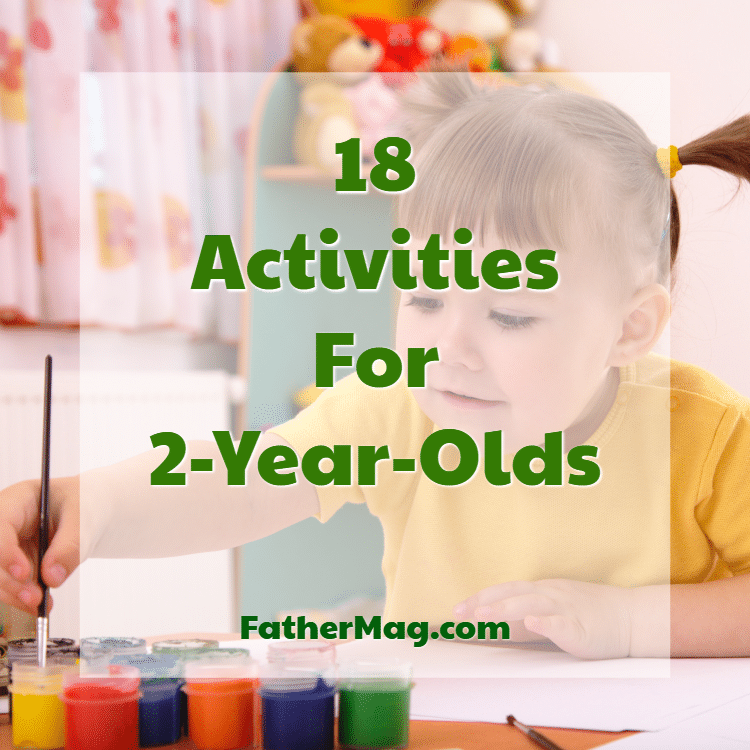 Most of these activities require parent participation, but that’s okay, because you remain the most important person in your two-year-old’s world. One of the skills that two-year-olds develop is the ability to pull something behind them. Pull toys are great entertainment, but resist the temptation to buy toys with a lot of bells and whistles. Keep in mind that it’s the action of pulling something that’s important, not what the toy is doing. When toddlers are engaged in the action of pulling something, they are walking forward, and most of the time it’s hard for them to see what the toy is doing. Also, many pull toys tip over easily, and that may frustrate your child. Wagons with a wide, tip-resistant base are best. They can be used to carry blocks, stuffed animals or other toys. You can also buy plastic wagons that come with shovels that are great for the beach. Two-year-olds are acquiring movement skills at a rapid rate. Most can run, stand on tiptoe and kick a big ball. They can jump off of low surfaces, and a little later they will accomplish the feat of jumping on level ground. (At first they will make a jumping motion, but their feet won’t leave the ground. Later they will be able to pick up their feet.) They are great climbers. All of these movements are developmentally important and should be encouraged. Your child will enjoy going to a playground, although he or she will still need a lot of help and close supervision on most of the equipment. This is a good time to invest in some simple, close-to-the-ground play equipment for the backyard. You can also play movement games with your toddler. A fun one is to move like different animals. You can jump like a kangaroo or jump on all fours like a frog. You can move like an elephant by holding one arm in front for a trunk and walking while swaying back and forth. Simplified versions of Simon Says and Red Light, Green Light will increase toddlers’ ability to respond to verbal commands. A game of chase is also appealing, but toddlers can get very excited by this game and may hurt themselves. Also, some parents choose not to encourage an activity that involves running away from them! Movement is even more fun when you add music! Just put on some tunes and start to move around. Your toddler will be sure to join you! At first, their dance moves may consist of simply bobbing up and down, but soon enough they will begin to move from side to side and even turn around. Then the arms may get involved. You can teach your child some basic dance moves or simply enjoy free dance. Your toddler will enjoy dancing to children’s songs and to other appropriate tunes. Accessories can add to the excitement. You can buy jingle bells to go around your toddler’s wrist, waist or ankles. Some toddlers will enjoy wearing a twirly skirt or tutu. Alternate dancing with using rhythm instruments like tambourines, maracas and clackers. Most of the time you’ll want happy, upbeat music, but experiment with slower tunes, too, and encourage your child to sway gently. Varying the tempo will help your child master the concepts of fast and slow. Another fun activity is freeze dancing, where dancers must stop moving immediately any time that the music stops. (Use your remote control or your phone to pause the music.) That’s a good way for your toddler to practice paying attention to cues. “Freezing” is also a good way to get your toddler to practice holding still. Most toddlers can only sit still for a minute or two. If they are standing, which requires core muscle strength, they may be able to hold a position for only a few seconds. At around the age of two, some children become interested in doing what their parents are doing. For example, they may want to sweep the floor or rake the leaves. Encourage these actions by buying child-friendly versions of the appropriate tools. The full-length handles on brooms and rakes are too hard for children to manipulate, and real tools such as screwdrivers and hammers can be dangerous. Other helping activities require no special tools. A child can help to dust with a soft rag, for example, or can help a parent take clothes out of the dryer. Science tells us why imitation is an important way to learn. When a child watches someone else perform an action, the part of the child’s brain that would be used for that action “lights up.” The child’s brain is practicing the action before the child’s body can actually do it. Imitation may be not only the sincerest form of flattery but the most potent way of learning. Unfortunately, scientists have found no evidence that giving a toddler a broom will produce an older child who is happy to help around the house! Read also: 16 Activities for 1-year-olds. Since food is a big part of family life, it’s natural for toddlers to be interested in cooking. At this age, elaborate play kitchens take up a lot of room and aren’t really necessary. (They probably appeal more to parents than to kids,) A upended cardboard box with burners drawn on makes a fine stove. Plastic food is worth the investment, however, and eliminates the mess of using real food. Play dishes and miniature pots and pans are also worthwhile as they will be used over and over. Numerous parents have reported that around two, their children became interested, or maybe even obsessed, with carrying things with them. This could be in part an imitative behavior. They see their parents leave the house with briefcases or handbags. They may see their siblings with backpacks and sports bags. Also, toddlers are just becoming acquainted with the concept of “mine.” Once they have recognized an item as theirs, they may be reluctant to part with it. Carrying something with them is also a way of handling transitions. Going from one place to another can be stressful, and taking a favorite toy or lovey along for the ride can help. Parents can give their toddlers carry bags or backpacks for putting things in and taking things out. These activities are good for motor skill development. Also, there are lots of cute toys in the carry-and-go category. At the age of two, however, it’s best to keep it simple. Don’t buy carry-and-go toys with lots of pieces or carry cases that are hard to manipulate. The act of carrying is more important than the items carried. Children spend much of their lives protected from the weather, but it’s good for them to experience hot and cold, dry and wet. Wet weather is likely to be the favorite of your toddler. Purchase some foul weather gear like raincoat, waterproof boots and umbrella. Then wait for a gentle shower when the temperature is mild. As long as there’s no thunder or lightning, playing in the rain is safe fun. If you don’t want to go out in the rain, wait until the shower is over. Your child can still jump in puddles and feel the rain dripping from eaves and trees. With your help, your child can learn much from the natural world on a rainy day. Point out the dark clouds and wait for the sun to come out. You might even see a rainbow! Watch for birds and animals. Do they hide from the rain or enjoy it? Lots of times worms come out of the ground after a rain. You’ll be fostering a love of nature and a better understanding of your local creatures. Pretend games are great ways for toddlers to learn, and your child will enjoy pretending to be in a car, boat, train or airplane. If you have some child-sized chairs, put two side by side to create a car. Take turns “driving.” Be sure to make appropriate engine noises and occasionally honk the horn! You can put the chairs in single file and have a pretend train. A cardboard box can become an airplane. Use heavy tape to attach two of the cardboard flaps to the sides for wings. A big plastic tub makes a pretend boat. Your child will enjoy a gentle rocking action and then faster rocking when the waves are big! While pretending to be in a boat is fun, the real thing is even more so. A local park or zoo may have paddle boats or canoes for rent. For safety’s sake, it’s good to have a ratio of two adults for each child while boating. Also, of course, everyone must wear life jackets. Riding a bus or train can also be enjoyable and educational for your child. If your child is two, you’ve probably been reading to him or her for a while. Your child should be developing basic book smarts, like understanding titles and knowing how to hold books and turn the pages. By the age of two, most children can get through an entire child’s book, especially if the text is limited to a sentence or two per page. This is also the time to make the reading interactive by asking questions. “What sound does the cat make?” “Joey has a big smile. Can you make a big smile like Joey?” At this age many children like to read the same books over and over, so it’s important for parents to pick books that they enjoy, too. You can extend the concept of reading by pointing out labels around the house and the signs you see while running errands. This will help your child understand the function of written language. It’s great for your child to observe you reading your own books, too. Some time after they turn two, some children show interest in learning the letters of the alphabet. Other children won’t be ready until after the age of three. Don’t push this type of learning unless you see signs of readiness. Many children who didn’t have an early interest in the alphabet become amazing readers. Don’t stress about teaching letter recognition, and don’t measure your child by other children in the same age group. Some children are more interested in numbers than in letters, and some children are more action-oriented. If your child does demonstrate an interest in letters, there are many ways to build on that interest. If your child enjoys music – and what child doesn’t – learn some alphabet songs. Look on the Internet for some catchy alternatives to the classic ABC song. Your child may also enjoy alphabet books, puzzles, and toys. Magnetic letters are a classic way of learning the alphabet. You can put them on the refrigerator since most families spend a lot of time in the kitchen. Some parents prefer keeping the fridge pristine and using cookie sheets for magnetic letter play. Learning names is another important gateway to learning the alphabet. If you’ve ever visited a preschool, you probably noticed that kids’ names are everywhere. Use this tactic at home. When your child makes a drawing, write his or her name on it, naming the letters as you go. At first, children often identify their names by the beginning letters and may confuse their names with other words that start with the same letter. Soon, however, they will recognize the overall shape and look of their name. From there it’s a short jump to learning each letter in their names. The age of two is a little early to teach number recognition. Numbers are usually introduced after letters. It’s not too early to introduce counting, which many two-year-olds consider great fun. You don’t need special equipment to teach this skill. Just encourage your child to practice. Here are a few ways to incorporate counting skills into everyday life. Practice counting body parts: nose, ears, fingers, toes, knees, and elbows. Ask your child how many of a particular food item he or she wants and count them out. At the grocery store, let your child help you count out apples or potatoes as you put them in the bag. Cut a hole or a slot in an oatmeal box or food storage container and help your child count objects while putting them in. Teach your child counting rhymes and finger play games that involve counting. Show your child how to put toy cars, blocks or other objects in a line and count them. Count the steps when you go up and down stairs. There are tons of board games that involve counting, as well as online games, but the best way to teach counting at this age is through everyday activities. A word of caution: Many objects that would otherwise be great for counting play are small enough to be considered choking hazards. Look for items that are too large to fit through a toilet paper roll. At the age of two, your child is old enough to play with blocks. Every child should have a set of basic wooden blocks in assorted sizes and shapes. Choose the colored ones, and you’ll add another possibility for learning. Novelty blocks may look interesting, but regular wooden blocks can be played with for years. The large-sized plastic bricks (Duplo or MegaBloks) that snap together are also great fun and very versatile. You can introduce your child to a variety of activities using blocks. Building tall towers is the all-time favorite, but blocks also combine well with other toys. Show your child how to use them to build garages for toy cars or fences for toy animals. Set blocks on end and let your child knock them down with a ball. Block play fosters a wide set of skills. Most obviously, it improves motor skills and spatial sense. It also helps with language development, problem-solving and divergent thinking. At a little bit more advanced age, it’s great for group play. Read also: 13 Best Food Activities for Kids. Here are some activities that you might be able to do on your walk. If you find a tree with a low limb, let your child sit on the limb. If your path has a bridge over a stream, show your child how to drop stones, sticks or leaves into the water. Encourage your child to enjoy the different smells, such as flowers, evergreen needles, tree bark, and fungi. Look for spider webs. If the spider isn’t visible, wiggle the web and see if it makes an appearance. Take a large, child-friendly magnifying glass to look at things close up. Of course, in order to keep your child safe, you should know how to recognize poison ivy, oak, and sumac. You shouldn’t handle any insects, plants, berries or mushrooms that you can’t identify as safe. If you see something interesting that you aren’t sure is safe, take a picture with your phone and research it later. In that way, you’ll grow in your own knowledge as your child grows. 14. What Color, What Shape? Two-year-olds are also ready to start identifying colors and shapes. Like counting, this skills is best fostered using everyday objects. Develop the habit of commenting on colors and shapes when you notice them. Then transition into asking your child to identify them. You can buy a shape sorting game or improvise your own. Colored blocks can be sorted by color and shape. For a super-safe sorting game, buy ordinary kitchen sponges in different colors and cut them into different shapes. Your child should have been drawing with crayons or markers for a while, but a two-year-old is old enough to enjoy more art experiences. Fingerpainting is fun, but this is also a great age to introduce print making. Show your child how to dip an object into paint and press it on the paper to create an interesting print. You can use household items such as cookie cutters, sponges and bubble wrap. You can also make prints using leaves and flowers. For minimal mess, always use washable paints. You can also reduce clean-up time by keeping disposable plastic tablecloths on hand. Also, try putting a piece of art paper in a shallow baking pan to contain drips. You can also set up an art table outside and hose it off when your child is done creating. The beach is like a giant sandbox for kids, but with bonuses like tidepools and waves. It’s also a place where your child will need close supervision. Beach shoes are a must, as is protection from the sun. If your child is going to be playing in the water, even at the edge, a life jacket is a must, and you should be within an arm’s length at all times. Offer your child plenty of water. Your toddler can get dehydrated even when surrounded by water. Don’t bother to take a lot of beach toys. Basic beach pails and shovels are fine. Here are some favorite toddler beach activities. Let your child splash in the edge of the water. Look for creatures in tide pools. Collect shells and sand dollars. Create sand art. Sand castles can be challenging for two-year-olds, but you can help your child make simple faces or animals out of sand. Add detail with seaweed and seashells. 17. What About Screen Time? Many two-year-olds are very interested in screens. The American Academy of Pediatrics (AAP) recommends no more than one hour of high-quality viewing per day, and they also recommend that parents watch with their children. Enforcing that time limit can be difficult, however, and parents can expect a few tantrums when toddlers want to watch more than their allotted time. It’s also worth thinking about what device you want to let your toddler use for watching. Toddlers who are allowed to watch on their parents’ phones may start begging to watch any time they catch sight of the phone. If you have a separate device for your toddler’s screen time, it’s easier to limit access. Parents should set guidelines for video-watching early. Experts say that appropriate videos for children are slow-paced and not too intense. They encourage children to talk, sing, dance and count. When parents co-watch with their children, they can incorporate learning from the videos into their toddler’s daily activities, thus extending learning. Videos should not be used to pacify children, and it’s not a good idea to use screen time as a reward because it makes the activity seem more desirable. Many good parents occasionally break their own rules, so don’t beat up on yourself if you do. Still, a video habit is easier to prevent than it is to break. Check out: 16 Best Activities for 3-year-olds. Before designing an elaborate activity for your toddler, consider four things: how long will it take you to prepare, how long will it take to clean up, how long will your toddler actually participate and how many times can the activity be repeated. Many activities that you can find in books and with an Internet search are quite time intensive and may not hold your child’s attention for long. In many cases, your time is better spent interacting with your child rather than preparing an activity. While parental involvement is key to successful toddler activities, it’s best to let your child take the lead. Children will not only show us where their interests lie but also use toys and play materials in ways that their parents could not have imagined. As long as the activity is safe, let your toddler experiment. If it’s too messy, take it outside!